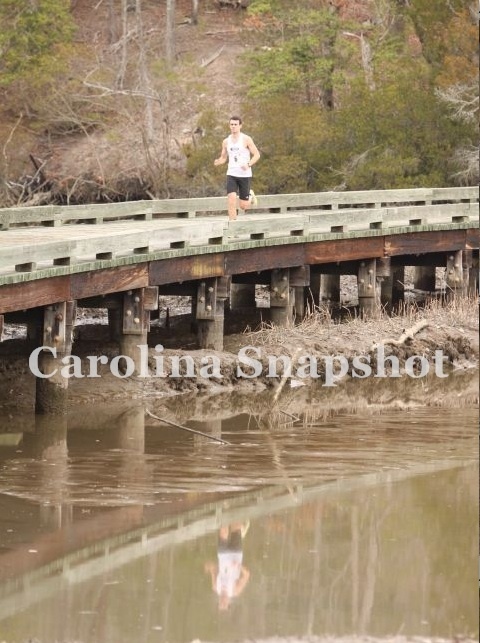 Thanks to Skeeter, I found where the pictures were posted from the Colonial Half Marathon last weekend. Here are two good ones. 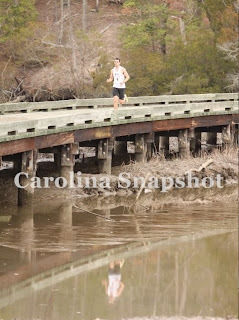 This one is right after mile 3. I'm running with the mind Ninja, before he fell back. It turns out that he got 11th place, running 77:33. Not bad for a guy who sounded like he was dying immediately. Also, he is younger than I am?!?! He was in the 20-24 age group. 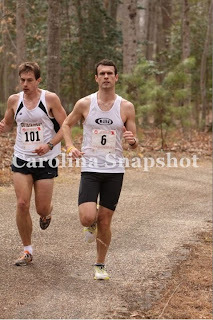 Running next to him, I assumed he was way older, probably a masters runner who was in over his head. I guess not. My wheels hadn't fallen off yet, and I was just thinking about how well this race was going, and that I had plenty of time to get rid of the mind ninja before the race really began. Boy was I wrong! Next we have one right around mile 9.5. I'm coming back over the Hornsby Bridge. I like the reflection. I was trying to salvage my race here, but I wanted to stop. At the end of the bridge, where the photo was actually taken from, I turned back and saw the three guys behind me. One of them was the mind ninja. Now that I've looked at the results, I finished 23, 61, and 80 seconds ahead of those guys, despite them being right behind me. As I said before, the race was SLOW. Full results can be found here.